Audi has announced the pricing for the refreshed 2019 Audi TT RS, which starts at $67,895, including the destination fees. At the front the 2019 TT RS has been updated with a slightly more aggressive front fascia with larger air intakes and a new spoiler. At the rear there’s a new fixed rear wing spoiler and large oval tailpipes. The TT RS comes standard with LED headlights with LED daytime running lights and standard LED taillights with dynamic rear turn signals. If you want cooler rear taillights, OLED (organic light-emitting diode) rear taillights are available. The TT RS comes standard with 19-inch Audi Sport wheels in titanium matte finish with summer performance tires. The new Dynamic package adds 20-inch Audi Sport 7-spoke design forged wheels in titanium matte finish with summer tires, red brake calipers and a Sport exhaust system with black tips. Lastly there are three new colors to choose from: Turbo Blue, Tango Red metallic, and Kyalami Green. Inside the 2019 TT RS comes standard with the Audi virtual cockpit and the Audi phone box, which can charge your smartphone wirelessly. 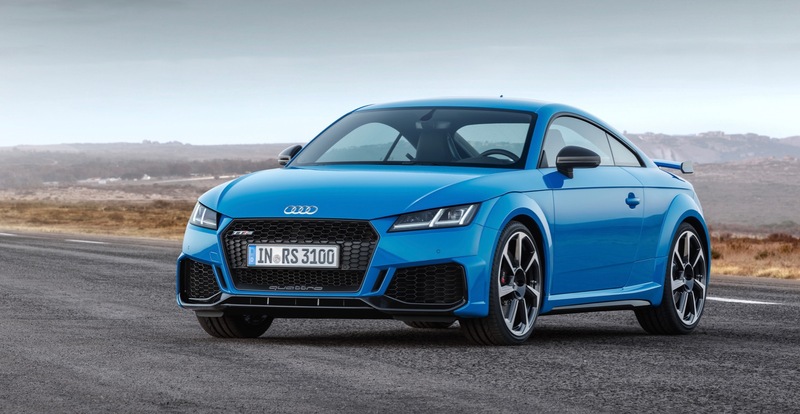 Most importantly, the TT RS is powered by a 2.5-liter five-cylinder engine with 394 horsepower and 354 lb-ft of torque that’s mated to a seven-speed S tronic dual-clutch transmission. The TT RS can reach 60 mph in 3.6 seconds.